Provenance: Private Collection, Fort Myers, FL. 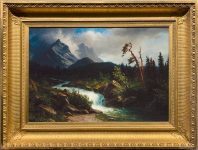 (circa 1920) Western Landscape will be included in Melissa Speidel’s forthcoming catalogue raisonne of Albert Bierstadt’s works. A letter from Melissa Speidel will accompany this lot. Like two old men leaning away from the wind, the trees at right, one stripped, the other all but–red pines, perhaps–call to mind Albert Bierstadt’s Hudson River School roots and affinities, where Cole, Durand, and others, had thought of trees as people, individuals with histories, stories they tell through their weathered twists and curves. Though it’s impossible to say for sure, Western Landscape has the feel of Bierstadt’s paintings of the Canadian Rockies. Wherever this is, snowmelt might torrent down this mountain, but the prevailing winds, as the two trees tell it, swirl back around and up the valley. The tales they would tell, these two old friends, are of storms bearing down like giants and of sunning themselves in spring light.